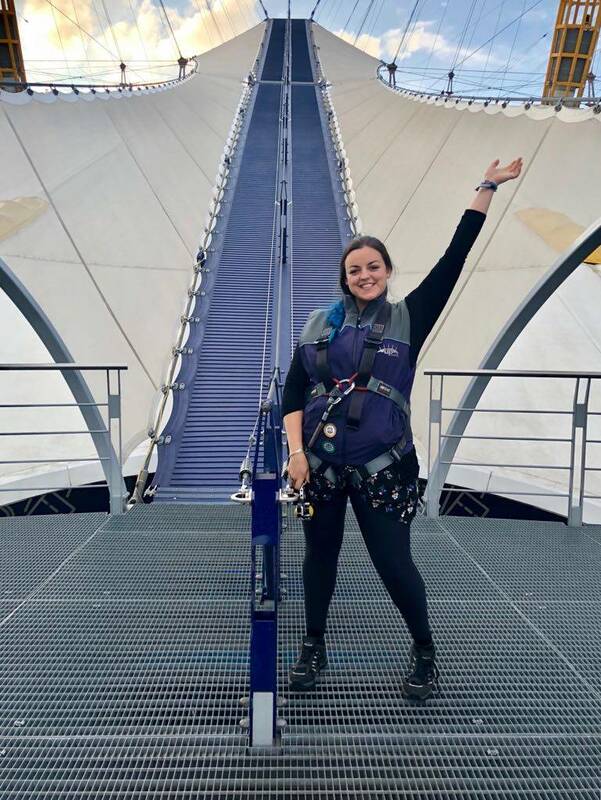 Climbing over the O2 with Up At The O2 is something I have wanted to do ever since I first heard about it. As you’ll know from previous blog posts I’m a sucker for unique experiences, so doing this was right up my street. 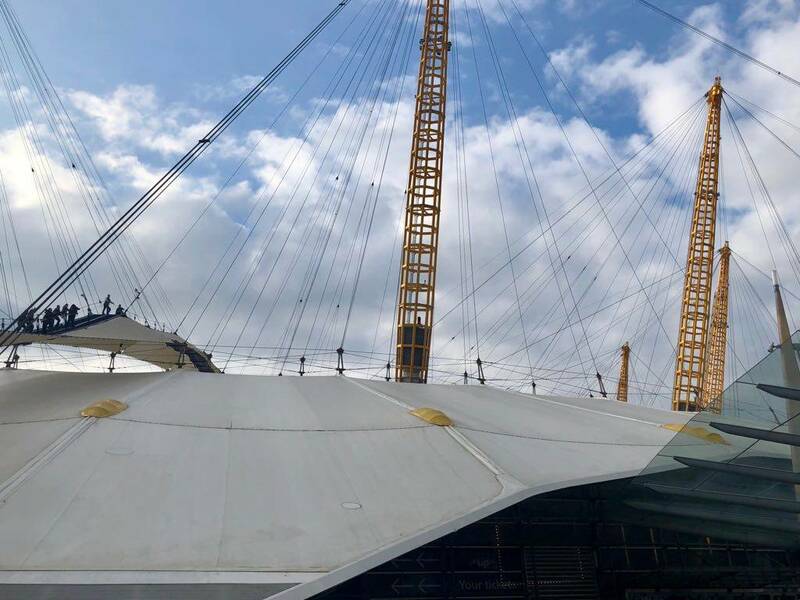 There are some really cool facts about the O2 itself which I didn’t know before our Up At The O2 experience! It’s made up of: 12 spikes to represent each month of the year, 52m tall for each week in a year, and the diameter is 365m for every day in a standard year. It’s a pretty nifty structure and is host to a range of things including: the 20,000 people strong arena, a cinema, a bowling alley, a club, and numerous restaurants and bars. However on this particular day I didn’t even venture inside the main area for my usual dinner and show, instead I climbed over the top of it which was a lot of fun. When you arrive there is waiver signing, a safety briefing, and equipment sorting. You’re given a pair of trainers with good grip, and a gillet. 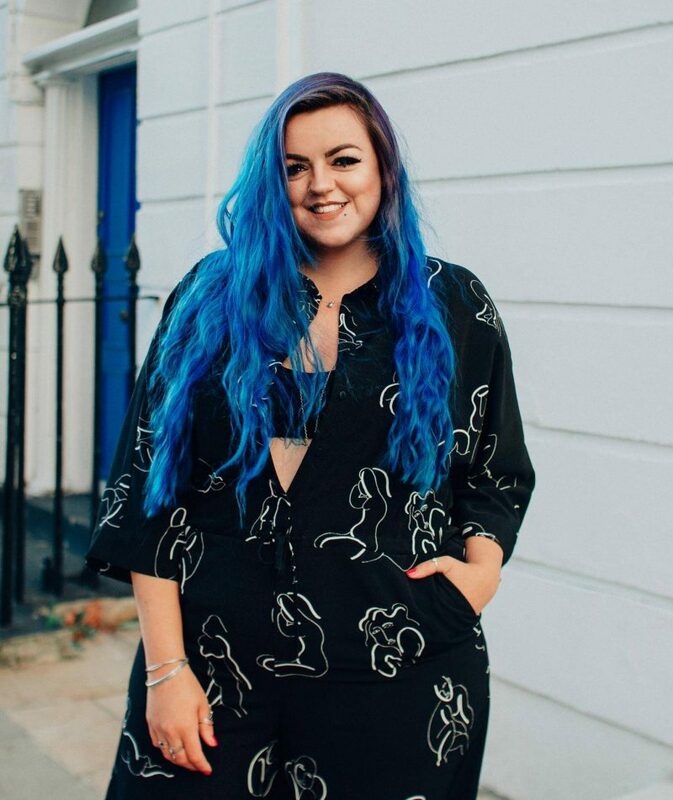 In the colder months it’s a full overall and although I wanted to wear this I’m glad they talked me out of it as I think I would have been far too hot! Hair has to be tied back and out of the way – it’s windy up there and for safety you don’t want it getting caught! 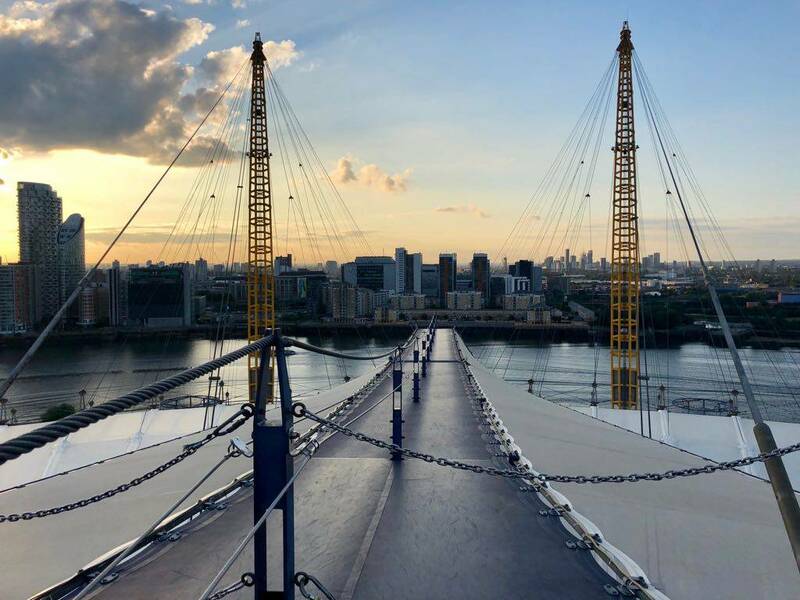 The walkway isn’t actually on the O2 tent canvas, but instead suspended 2m above and from one end to the other it is 320m long. To get to the walkway you have to walk up a few flights of stairs first, which is where the photographer will take pics of you. It’s worth noting you are allowed to take your own phone/small camera if it fits in the pocket of your gillet/overall, but you are not permitted to take photos at the initial start where the professional photos are taken. We were allowed as we were on an organised blogger trip. 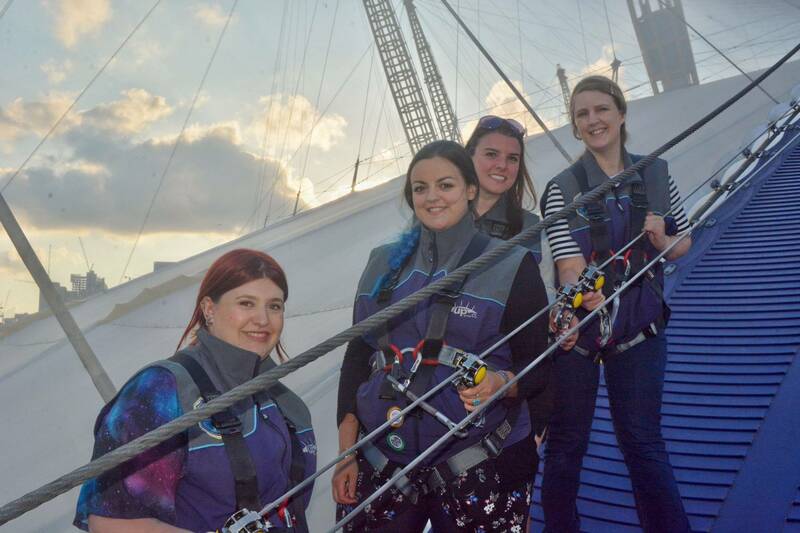 Love this photo below taken by the photographer of Rhian, myself, Regina and Joanne just before we made our way up! Once on the walkway I really noticed the slight bounce to it, which we were told is to replicate the surface of the tent structure below. You’re not allowed to bounce/jump around but when walking you can certainly feel the elasticity and if you’re at the front on the way down (which I was) it’s a lot of fun. For the walk you will have a guide but other than that it is unaided so you have to look out for yourself in terms of your harness, but to avoid any slips you’re attached to a secure continuous cable system (sorta like a fancy railing) which is in the middle of the walkway for you to stay attached to and guide yourself as you walk up/down. 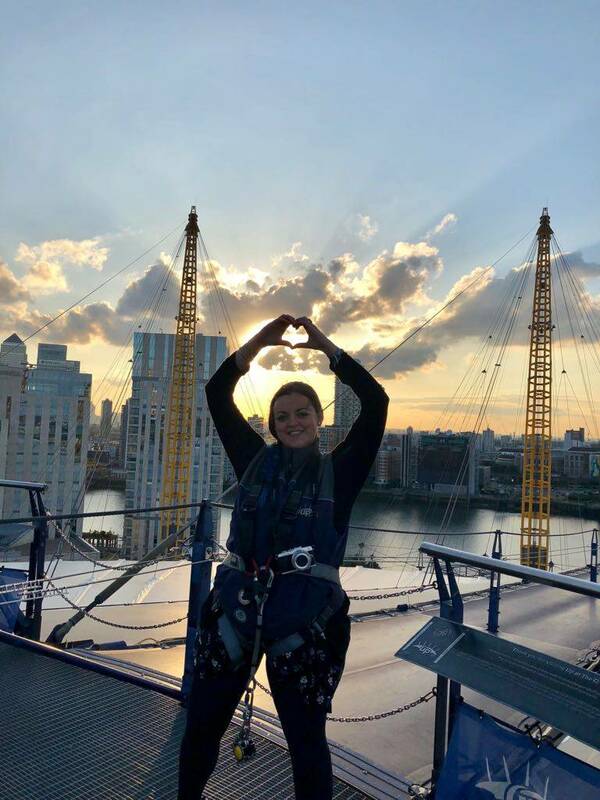 There’s a spacious viewing platform at the top where you can buy a glass of bubbly if you fancy, and take in the 360° views across London. Weather is really luck of the draw and I think the trips go ahead in almost all weather (including rain)! We were blessed with a gorgeous evening which couldn’t have been more perfect. It was mild enough to not get too warm on the ascent/descent, but warm enough that we didn’t catch a chill on the way up… And best of all: clear enough that we could see for miles across the city. Our guide Nathan was knowledgeable, helpful, friendly and fun, and I really think he was a credit to the overall experience and the Up At The O2 company in general. It was also handy that he is a photographer too and was v. willing to take snaps at the top: of you, your group, and of course a selfie with him in too for good measure. I’ve had a lot of people ask if the experience was scary, and for me – it wasn’t at all. I’m an Adrenalin junkie through and through so this was just great. During ascent the gradient is 28° and the descent 30 degrees. It may not seem like it but the 2 degree difference on the way down was really noticeable, perhaps because I was at the front? We were instructed to walk with our feet pointing downwards (not sideways as we could hurt our ankles), and take it easy. I do get a little nervous with heights sometimes, but because this wasn’t like a dangling kind of height (eg. not on a zip wire, etc), I found it almost calming and absolutely loved taking in the views during sunset. 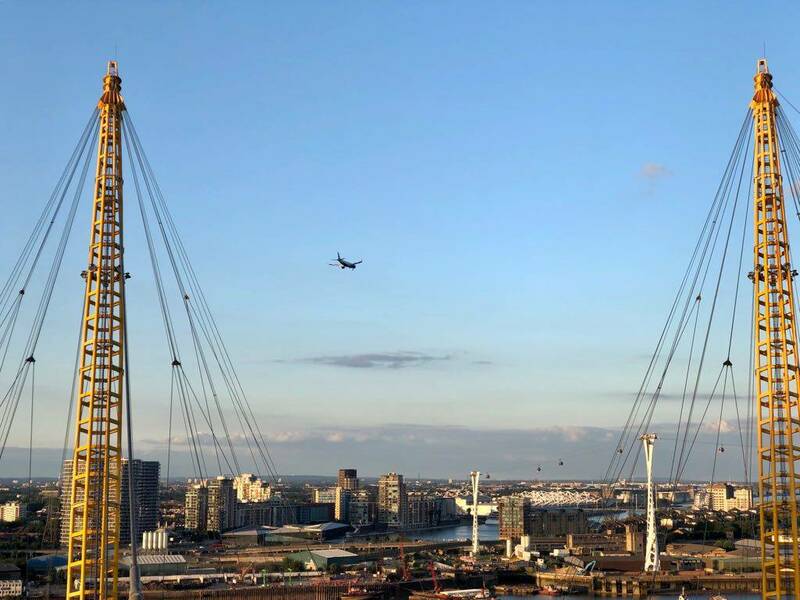 You also get a great view of planes landing at London City airport, if you’re into a spot of plane watching. From start to finish it took us around 90 minutes which was the perfect amount of time to walk up and down with ease, as well as enjoy the stunning views (up to 15 miles) in each direction. The experience costs £30-£36 depending on day and time, which I think is pretty reasonable. It’s a really unique experience where you get to climb an iconic London structure without the need for any prior training. Perfect to entertain friends/family from out of town, as a date night with someone special, or perhaps even a team building exercise with work. 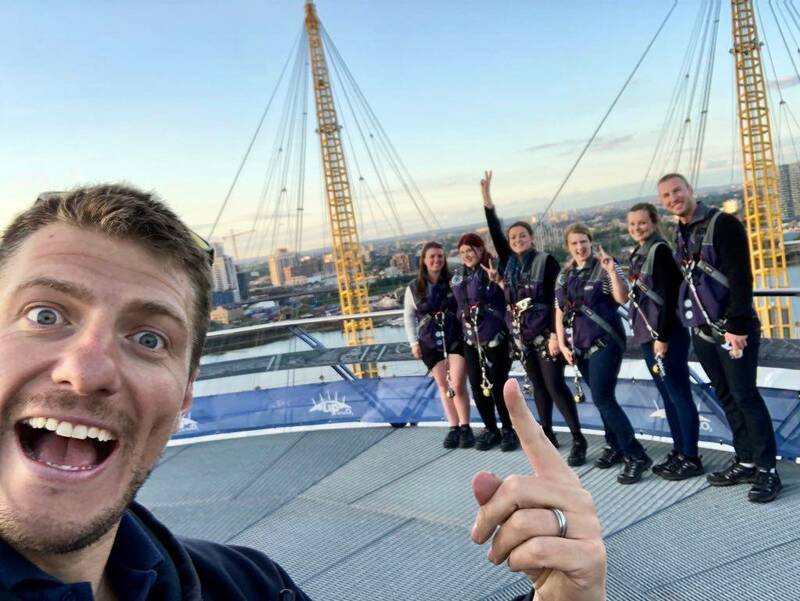 Thanks to Love Pop Ups London for organising the trip, Nathan for being a great guide, and Up At The O2 for hosting us (check out their website here)! This activity was provided free of charge by Up At The O2. However this review is an honest reflection of my experience. Gosh, I’d love to do this! I just need to pluck up the guts first, haha!